The social web has changed the way we do business foreverThe future of your company is not in measured, considered responses and carefully planned initiatives. Business today is about near-instantaneous response. About doing the best you can with extremely limited information. About every customer being a reporter, and every reporter being a customer. About winning and losing customers in real-time, every second of every day. About a monumental increase in the findable commentary about our companies. 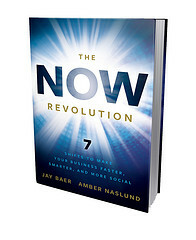 You can purchase a signed copy of The Now Revolution: 7 Shifts to Make Your Business Faster, Smarter and More Social here for $20.